president.ir – Stating that the United States has suffered a great failure in what it has started against Iran since January, the President said, “Today, the United States is isolated in the world and nobody has acknowledge and will accept the American way”. Speaking in cabinet session on Wednesday, President Hassan Rouhani said, “Today, the public opinions of the world is on Iran’s side and even inside the USA, many consider Iranian politicians and people the right side”. Stating that the United States is making empty threats, he continued, “The US has failed and will fail in achieving its goals. The diplomats of the Islamic Republic of Iran achieved considerable successes in the United Nations General Assembly, which led to US’ more isolation”. “An overwhelming majority of the countries throughout the world supported the JCPOA and appreciated Iran’s decision to stay in the deal, while condemning US sanctions against Iran as an illegal act,” continued the President. Dr Rouhani also said, “Violation of international commitments by the US and opposing some international institutions, including Human Rights Council and ICC, and their withdrawal from commercial commitments were what all countries were slamming”. The President of the Islamic Republic of Iran also said, “It was proved that Iran is the committed member and US is the violating member of international regulations”. “Iranians accept dignity and pride, not being US’ servant,” said the President, continuing, “This is why the United States will face absolute failure in achieving its goals”. Saying that the pressure that the US is putting on the Iranian people is to gain a small political achievement inside US, Rouhani added, “All US was trying was that they were after negotiation at any level to say that pressures made Iran succumb to negotiation”. “Europe has established a special institution for keeping its financial and monetary relations with Iran,” said the President, adding, “The European financial institution is an important step and JCPOA’s survival depends on normal economic relations with Iran”. 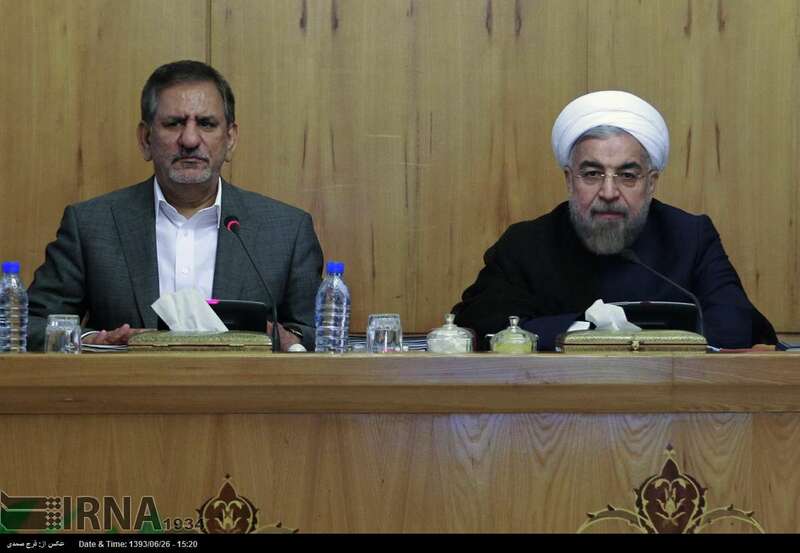 Expressing hope for the ICJ to announce a verdict in Iran’s favour, Dr Rouhani said, “Without a doubt, the Islamic Republic of Iran has achieved good successes in political and legal fields, as well as in the public opinions”. “I announce to the dear Iranian nation that the government is working as hard as it can to increase people’s welfare and secure the country’s interests,” continued Rouhani. He also referred to the “good decisions” made in the recent days to strengthen the Central Bank of Iran (CBI) and said, “It was decided that the CBI have the necessary authority to promptly purchase the foreign currency needed for export”. “The CBI is given full authority to regulate the market, the results of which can be seen in the recent couple of days,” he continued. He added, “Today, our foreign currency reserves are better than any other time. This is a big lie to say that the government is trying to obtain rials by increasing the price of foreign currencies”. Stating that, “Exchange rate must stay real, balanced” he said, “Stores around the country are full; nobody should worry about basic goods”. Appreciating armed forces and the IRGC for giving a decisive response to terrorists, DR Rouhani added, “I have to thank the armed forces and the IRGC for putting the Supreme National Security Council’s decisions into action and giving a decisive respond to terrorists who did not show mercy to women, kids and even a 4-year-old child”. “The world should know that we consider those who order terrorists acts as perpetrators of terrorism,” he continued, adding, “Iran’s response will always be decisive and strong”. Expressing happiness over the good achievements of democracy in Iraq, the President added, “Their election was held and parliament was established in the country, and right now, the President of Iraq has been chosen, forming the government of the country soon. We congratulate the great Iraqi nation on this achievement”. “The Islamic Republic of Iran has always been willing to promote peace, stability and democracy in the region and today, we are happy that we are witnessing this in Iraq,” added Rouhani, saying, “To counter US plots, we’re constantly in contact with friendly countries, including EU members, China and Russia”.